Home » IYIM NEWS AND EVENTS » Yom Yerushalayim Shabbat Dinner for 400 @ First Station! 400+ Shabbat Dinner is a hit! 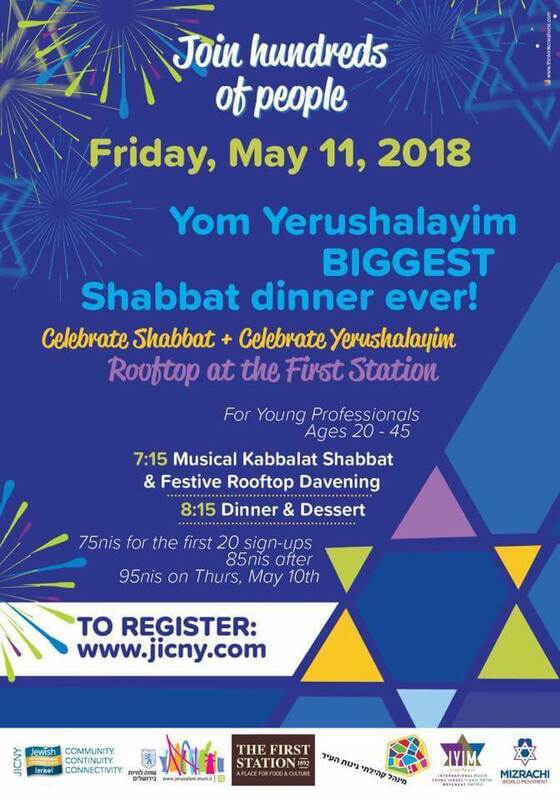 JICNY Israel in partnership with the International Young Israel Movement (IYIM) put on a first of its kind large-scale Yom Yerushalayim Shabbat dinner on May 11th, 2018 at the First Station in Jerusalem. The evening started at 17:00 with a pre-Shabbat concert featuring a live band, followed by a festive Carlebach rooftop davening. After davening, 400 guests joined together for a delicious catered dinner, flowing with wine and liquors. The evening ended with a HUGE bang with a Grand Dessert Oneg. Mayoral Candidate Ofer Berkovitch, of the Hitorerut party, was the featured guest speaker with opening remarks made by Dan Illouz, Member of Jerusalem’s City Council. The even had over 150+ people on the waiting list. One of the magical moments of the dinner was the Kiddush. At the very moment when Kiddush began, people who were shopping and eating at the open restaurants on Shabbat, stopped in their tracks and joined our group to say Kiddush. The silence was deafening – you could hear a pin drop. You could see and feel the desire of the people wanting to be part of a real Shabbat dinner. At that moment, over 500 people joined in – old, young, religious, secular – all said Kiddush together.